If you have your own mail server, such as a Microsoft Exchange or MDaemon mail server, this is usually hosted in your own office. If your broadband line ever goes down or if your provider changes your IP address by accident, then your mail server will be offline and emails sent to you could bounce back to the sender. If your server suffers a hardware or software failure, and needs to be rebuilt, you need to know that your mail is queuing up until the server is back online. With our Backup MX records service, we configure our backup mail servers to hold emails for your server if its offline. Once it comes back online, emails will be automatically sent to your server, so you have piece of mind that you dont miss any emails and emails will not bounce back causing embarrassment. 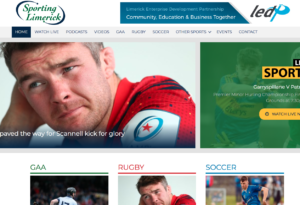 Sporting Limerick have recently launched their new site. Get all the updates on all Sports matters in Limerick, watch Live Streams of local matches, podcasts and more.